QUICK NOTE!!! 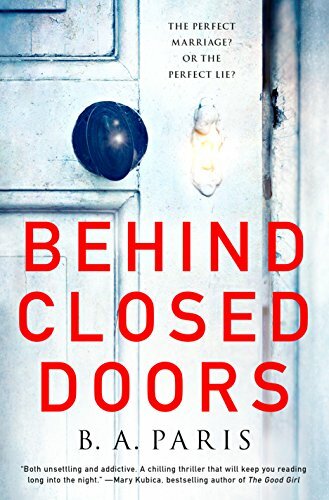 For those that love going into a psych-thriller blind (or by the blurb alone) stop reading the review, and instead, READ THE BOOK!!! I loved it, I 4.5 starred it, and I’m reviewing at 5am just to get it our of my system, because it affected me so. Mind you, I don’t spoil anything below, but I went in on that genius blurb alone, and it TOTALLY gave me a blurb-jolt. That, coupled with a few awesome but vague reader reactions, and this one had me guessing all sorts of possibilities! Rita: This is a fabulous book! TO THE VERY LAST SENTENCE!!!! Y’all will not be able to put it down!!! Sheri: Just finished it 😀 …quite good. Amy: Holy moly…my anxiety is through the roof because of this freaking book!! Anastasia: I’ve read about 4 chapters last night and the best word to describe the experience so far: Intriguing! R: Good luck with BCD, it comes at the price of sleep… Soooo hard to put down! Amy: Holy MOLY!!! I am finished with BCD and absolutely wrung out. But dang, that was a fun ride! Unsettling to say the least. And to me, utterly terrifying. This is every woman’s nightmare, but if you’re like me and you love a good psych-thriller, put this one on your “TO BE READ NOW” list! It almost unputtdownable, but you’ll need to put it down, just to catch your breath and settle your nerves. A blurb that had my stomach in knots with anticipation (I just HAD to read this one ASAP so I one-clicked it, price be damned! ), and a story that had my stomach in knots with dread. This was exactly what I was in the mood for, and it certainly delivered the chills. In fact, it’s yet another book that has given me a few nightmares, hence me writing a review at 5am… because I can’t sleep. R: I’m at almost 65% and I’m having to FORCE myself to stop so I can get some work done!!! Jean: I promise no spoilers! Amy: HOLY MOLY!!!! This book is working me over something awful!! My anxiety is through the freaking roof right now…and it’s not from angst so this is REALLY different for me. Jack is horrible. I would really like to nail his sac to a chair (a nail right between the boys…BAM!) and then slice his johnson open and turn it into a hooha. THEN I would turn him loose in general population in a prison. I. Hate. That. Man. I don’t know why I love dark reads so much, ’cause the really affecting ones make me feel so claustrophobic. I can’t breathe while reading, I find myself hyperventilating, jump up and pace trying to catch my breath, and end up watching a comedy, or just the good ol’ peaceful cooking channel to bring myself back to my own personal safety. But while I’m reading, and even a day or two after I’ve finished, when they’re good like this? I’m jolted awake (multiple times even) with that sense of terror, and sometimes I can’t get back to get back to sleep. Which is the case with this one. And yet, I LOVED it. Independent and happy Grace (that is caring for her younger sister that has Down Syndrome) meets the enigmatic, gorgeous “Jack Angel” (a successful, wealthy lawyer famous for representing and defending battered women). He woos her. Charms her. Makes her feel like the luckiest woman in the world. And soon into their whirlwind romance, they marry. It’s during evenings like this that I’m reminded of why I fell in love with Jack. Charming, amusing and intelligent, he knows exactly what to say and how to say it. I fix a smile on my face, praying that they’ll like me. Esther doesn’t smile back, so I guess she’s reserving judgement. But I can’t blame her. Since joining our circle of friends a month ago, I’m sure she’s been told over and over again that Grace Angel, wife of brilliant lawyer Jack Angel, is a perfect example of a woman who has it all— the perfect house, the perfect husband, the perfect life. If I were Esther, I’d be wary of me too. …but all is not well behind closed doors. I feel a sudden flash of happiness, which I try to hang on to. But it disappears as quickly as it came. Told completely from Grace’s perspective, you will feel every single moment. And right from the very atmospheric start, I just knew that Jack Angel could possibly be the devil himself. I hold my hands out in front of me and the shaking that I can’t control tells me what I’ve only just begun to realise but what Jack has known all along— that fear is the best deterrent of all. But I don’t want to say any more, because it’s all in the journey. Absolutely unforgettable and almost unputdownable (if you can stand it)! It was everything I expected from that blurb, and this is most certainly a cautionary tale. A dark read, indeed. I am half way through as I read until 3:00 AM. Good thing I have the day off 😉 Grrr… that Jack Angel is just- an evil devil?… back to reading! I can’t wait to hear what you think. Tee hee!!! That feeling of claustrophobia and then hyperventilating…YES!!! Oooooh Johanne… remember my nighttime anxiety attacks from that last book? This is like that bit even scarier. Great review Maryse! Just enough to hook everyone to read it with no spoilers whatsoever. And yes, hyperventilating and totally inside her head the whole time. I will not be forgetting this book. I finished! There was a particular moment in the book that I almost folded not wanting to continue. It was that difficult to take, to believe, to witness. I’m glad I stuck with it and was moved by the very gratuitous ending will making a silent prayer for those who are at going through even a fraction of Grace’s nightmare. This is one of my favorite genres! I am going to one click it! <3 Thanks for the review!